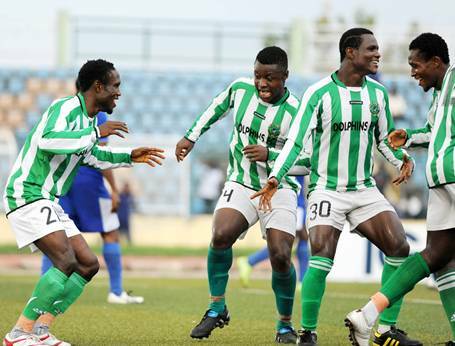 Dolphins FC, currently leading the Nigeria Premier League 2010-2011, has the third best defensive record in the league. In this post, I will present one of the main reasons behind the club’s current success, central defender Austin Festus. Festus is arguably the toughest defender in the Nigeria Premier League and definitely one of the most interesting prospects in the center-back position. My first record of Festus is from 2005 when he was part of the Nigeria U-17 national football team. Festus was part of the team who participated in the 2005 UEFA-CAF Meridian Cup. He also played for Nigeria U-17 in the African U-17 Championship in Gambia. The official squad list from the tournament shows that Festus is born 31.01.1989. He is therefore 22 years old at the time of writing. At this time, Festus was playing for an amateur club called Paulson FC, based in Benin City in southern Nigeria. Festus “disappeared” from my radar after the African U-17 Championship but he obviously left Paulson FC and joined the city rivals Bendel Insurance FC. Despite being only 18 years old, Festus was a regular performer for Bendel Insurance FC during the Nigeria Premier League 2007. Bendel Insurance FC was relegated from the Nigeria Premier League 2007-2008 but Festus still managed to stand out from the crowd, being included in the squad of the Nigeria U-20 national football team towards the end of the season. During 2008, I am not sure exactly when, Festus joined Dolphins FC from Port Harcourt. Festus was yet again playing in the Nigeria Premier League in 2009-2010, learning a lot from more experienced centre-backs such as Dolphins-legend Emma Godwin and Victor Ezuruike. His collaboration with the two has developed further in the current season and Festus / Godwin should now be regarded as the regular pair in central defence. Festus has scored one league goal this season, on 09.06.2011 against Warri Wolves FC. As far as I know, this is the only goal he has ever scored in the Nigeria Premier League. Festus has also been training with the Nigeria B and the Nigeria U-23 national football team during the season. Personally, I don’t think Festus is far away from a call-up to a future friendly match for the Super Eagles. A lot has been said about Festus during the last couple of years. Journalists, colleagues and football experts are mostly referring to his strength and toughness. Festus is also described as a hard tackler, a true fighter in the air and a good reader of the game. Festus is the kind of player who always wants to win and a very difficult opponent for any striker. “It is my job and I will keep him quiet. I do not even know why people are talking about him. He will even be substituted. We will beat them and Ezeji will be a non-issue in the match”. The full name of Festus is “Austin Osaretin Festus”. He is sometimes referred to as “Austine Festus”.